Mill+ Campfire team joined forces with Blumhouse and USA Network to help them launch TV Series The Purge. The Purge is set in a storyworld where all crime is legal for 12 hours every year. Campfire’s multi-channel campaign celebrated this dystopian holiday with two major components: a) PSC - an on-air, online and social shopping infomercial, with bubbly presenters hawking in-world merchandise that Purge Preppers could receive by calling our telephone hotline or ordering online, and b) a companion physical installation at SDCC, a fully built-out, 3000 sq ft retail outlet, staffed by trained actors working to a 150 page script, and with over 70,000 pieces of specially designed merchandise to give away to our 4000 visitors. 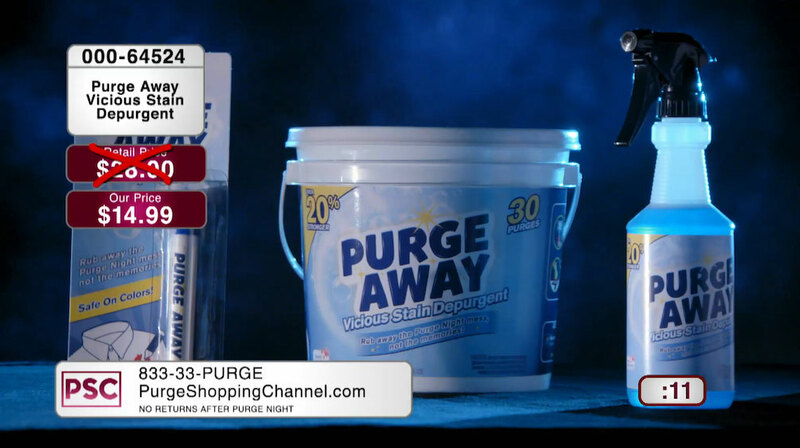 Whether fans shopped online or in-store, we gave them everything they needed to prepare for the perfect Purge Night, from emergency candles, Purge energy drinks, and Purge Away stain removers. Blessed Be the New Founding Fathers and America!